For a true taste of Northern Thailand, look no further than the city of Chiang Rai in the Golden Triangle region of Thailand. The atmosphere, cuisine, and even people, are quite different in Chiang Rai to what you might have experienced in Bangkok, in the south of the country, and as a gateway to this region of Northern Thailand, Chiang Rai makes for a great base for getting out and exploring. But Chiang Rai has some of its own magical attractions too, such as the stunning White Temple, numerous museums, and beautiful scenery. If you’re visiting Thailand to soak in its culture, traveling from Bangkok to Chiang Rai is highly recommended to give you a sense of how the country varies, and to see some wonderful scenery along the way! Chiang Rai is one of Thailand’s northernmost cities, making it quite a distance from the country’s capital, Bangkok. Around 800 kilometers (500 miles) separates these two cities, but the lengthy journey will take you through numerous smaller towns and cities, and a great deal of beautiful scenery, so getting there is half the fun! If you’re familiar with traveling in Thailand, you’ll know that crossing the country can take a long time. Roads are not always in the best shape for long distance and/or high-speed driving, but the benefit of traveling by road is that once you get outside of the larger cities, the roads are quiet with little traffic on them. Buses from Bangkok to Chiang Rai are always a popular choice because they’re very affordable, but the journey time may put some travelers off. 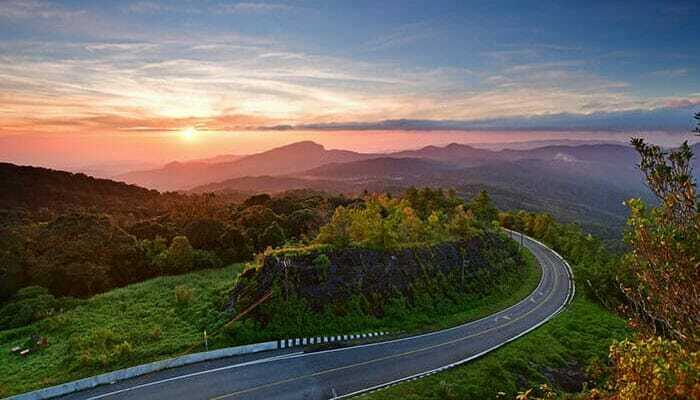 There are also direct flight to consider if you want to get to Chiang Rai much faster, but there are no direct trains between these two cities – you would need to catch a train to Chiang Mai, then get a bus from there. Frequent departures, several different companies to choose from, and very affordable prices are three of the major reasons why traveling by bus from Bangkok to Chiang Rai is so popular. Buses are great for tourists traveling on tighter budgets, but they’re also used regularly by local passengers too, and with so much demand for the buses, this is one of the reasons why the prices are kept so low. Departing from Bangkok by bus you have a few different options for where to depart from. The main departure point is Mo Chit Bus Terminal as this is the bus station for services to the north of Thailand. Having been refurbished, this bus terminal is really quite nice with its air conditioning, lots of seating, food courts and more, so if your bus happens to be delayed, waiting it out is not the big deal it used to be! You can also buy tickets for departure from a couple of different tour companies. There’s one, for example, on Khao San Road if you’re staying in that part of the city, making it more convenient to pick up your bus here rather than having to travel first to the bus terminal. While Khao San Road is a good pick up point, we wouldn’t necessarily recommend booking your tickets through one of the many travel agents in this area as they are not always reliable or reputable. Instead, visit 12Go.asia where you can safely book your Bangkok to Chiang Rai bus tickets while comparing the cost and service from a number of bus companies at the same time. Bangkok Bus Line, Siam First, and Budsarakham Tour are three bus companies you could try who depart from Mo Chit Bus Terminal. They have Express and VIP buses, but considering the price of a seat on a VIP bus is only marginally more, we would recommend going on the VIP bus for added comfort on such a long journey. 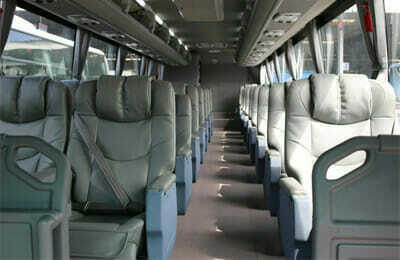 You’ll tend to get more leg room and more space around you on the VIP buses, and they offer more facilities on board. While you could probably find a daytime bus from Bangkok to Chiang Rai, night buses are more popular. You will leave late afternoon or evening from Bangkok, traveling overnight, and arriving in Chiang Rai early the next morning. The benefit with this is that you avoid having to pay for an extra night’s accommodation, and you should, hopefully, get some sleep along the way! The main downside, however, is that traveling overnight you’re not going to see much of the beautiful scenery along the way. The drive should take somewhere between 12.5 to 14 hours, so it’s a long trip by bus. The main plus to traveling by bus is the cheap ticket price, but, with numerous budget airlines offering flights from Bangkok to Chiang Rai, catching a plane may not be as expensive as you would think. The best thing about flying is that you’ll get to Chiang Rai much faster. The flight takes between 1 hour 15 and 1 hour 30 minutes, so it’s really quick, making this the ideal choice for someone who doesn’t have a lot of time to spare. And, when you can fly for about double the price of the bus ticket, the time you will save does seem to make sense. You can depart from either of Bangkok’s airports: Dun Mueang or Suvarnabhumi. Both airports have numerous flights each day, with several different airlines. Prices do vary quite considerably across the airlines, so do shop around before making your booking. 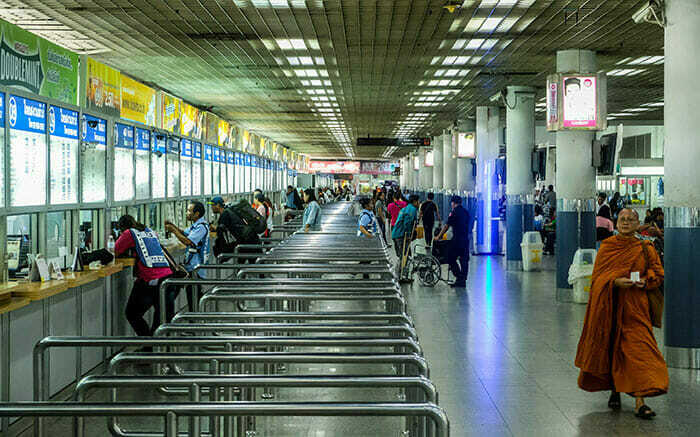 On websites such as 12Go you can do one search and get all the different options for travel from Bangkok to Chiang Rai, including both Bangkok airports. We would highly recommend using an online booking service like 12Go for ease of booking and peace of mind. From Suvarnabhumi you can choose from Thai Smile (Thai Airways low cost airline), Bangkok Air, and Thai Vietjet, with departures throughout the day starting around 6:30am. Of these airlines, you should find that Thai Vietjet is the cheapest, although their tickets do not include baggage allowance whereas the other airlines do, so bear this in mind. 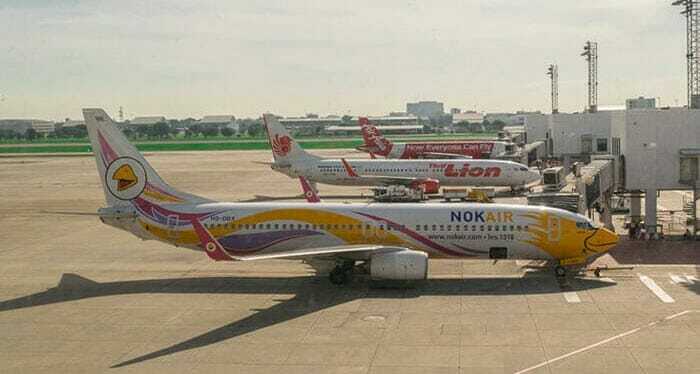 Departing from Don Mueang in Bangkok, your choices are with Air Asia, Nok Air, and Thai Lion Air. In general, you should find that Thai Lion Air is cheapest, although neither of these airlines offer baggage allowance in the cost of the ticket. The Chiang Rai International Airport almost entirely serves Bangkok to Chiang Rai flights, so as mentioned earlier, there will be plenty of departures to choose from. The airport in Chiang Rai is located about 8 kilometers (5 miles) outside the city center and is connected by taxis. One final option for getting from Bangkok to Chiang Rai is to go by private taxi, however, this is extremely expensive for just one or two people and would only make sense if you were traveling in a group and hired a taxi van that could carry up to 9 passengers. The cost for a hired taxi or van is usually around 11 000 to 13 000 baht (also bookable through 12Go.asia). Our recommendation would be to catch a flight from Bangkok to Chiang Rai unless you’re on a very tight budget and do not mind a long bus ride!